"He loves me... 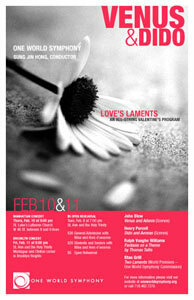 He loves me not..."
This common Valentine's Day worry is also the concern of both Venus and Dido, central heroines of One World Symphony's Valentine-themed concerts. The program, compiled by conductor Sung Jin Hong, also illustrates the importance of musical influence. Vaughn Williams's "Fantasia on a Theme of Thomas Tallis" (1910) is based on a psalm setting that Tallis wrote in 1567. Embellishing Tallis's When Rising from the Bed of Death with layer upon layer of invention, the Fantasia reaching glorious climaxes in the broad chords for the divided strings. It is a rare and highly effective example of a bond between composers across the distance of four centuries. Another such example is Purcell's Dido and Aeneas, which, for all its inventiveness, was closely modeled on Venus and Adonis, a work by Purcell's teacher and colleague, John Blow. Both dramas are in three acts, each recounts a doomed love affair between a domineering woman and an ambitious man, and both end tragically with the death of the protagonist. The enduring themes -- love, hope, loss, and despair -- of these works give them a freshness that belies their age. True to its tradition of presenting new works by rising composers, One World Symphony also showcases Stanley Grill's world-premiere Two Laments, which are inspired by poems of Yeats, one of the most "musical" of English-language poets. Grill's composition is scored for soprano solo and an orchestra of strings. So, this Valentine's Day season, put your lovesick worries aside and enjoy these compelling concerts by one of New York's most exciting and exuberant musicians of One World Symphony.